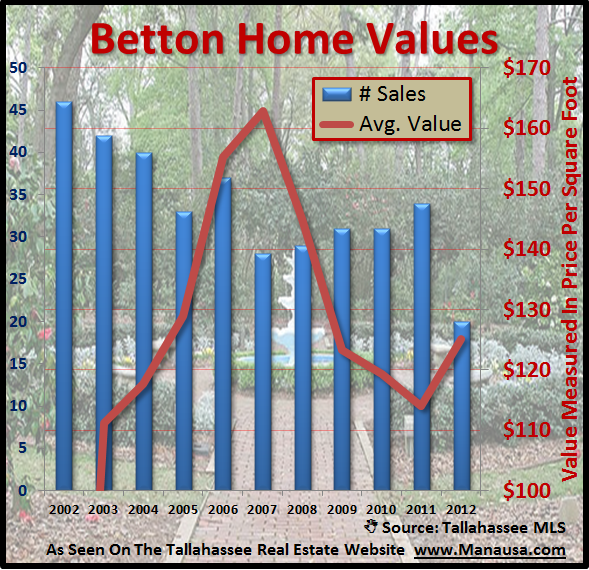 Every single neighborhood in Tallahassee has seen home values decline, but none will weather this tough housing market better than the Betton neighborhoods (IMHO). I have written reports on the Betton neighborhoods (Betton Brook, Betton Estates, Betton Hill, Betton Hills, Betton Oaks, Betton Place, and Betton Woods) for many years, as these neighborhoods are not prone to some of the problems that newer subdivisions in Tallahassee must endure. For example, we won't see continued building of new homes during a glutted buyers' market like we are seeing in Southwood and Bull Run. 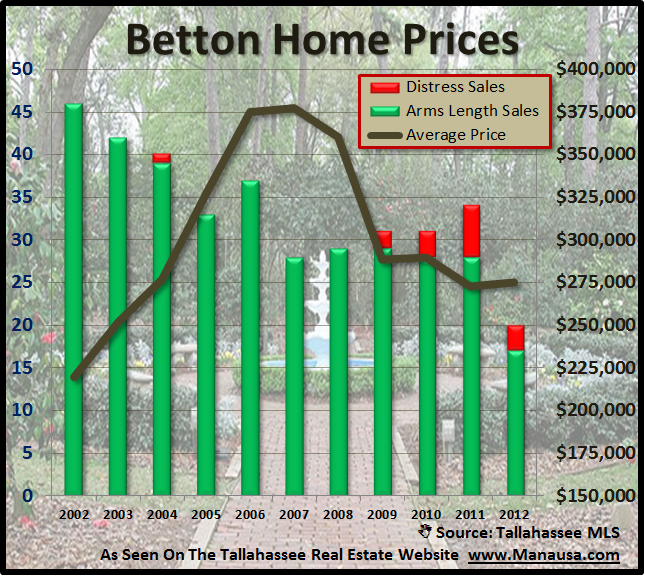 And with location, location, location working for the Betton neighborhoods, they will certainly bounce-back as fast as any subdivision in the Tallahassee real estate market. Currently, there are thirty homes for sale in the Betton neighborhoods, marketed in the Tallahassee MLS. These homes are priced from as low as $165,000 to as high as $765,000. The real estate graph below shows that the average price for a home sold in the Betton neighborhoods over the past year has been around $275,000. The green bars measure arms-length home sales, while the red bars measure distressed property sales. It appears that the Betton neighborhoods have a relatively low level of short sales, foreclosures, and bank owned property sales. Home values have shot up thus far in 2012, which is a trend contrary to most other neighborhoods in Tallahassee. We will have to monitor the short sales and foreclosures in the Betton neighborhoods, as these will have the largest bearing on value movement over the next few years. If you are thinking about selling a home in the Betton neighborhoods, drop me a note and I will show you how to take advantage of the strength of Betton when you market your home online. The following is a list of the most recent home sales in the Betton neighborhoods (recorded in the Tallahassee MLS). I hope you enjoyed this Tallahassee neighborhood report. Please check back for our charts, graphs, and analysis of other great subdivisions in Tallahassee, including updates on the Betton neighborhoods.